Full results are available in the master thesis of Jens Müller and our paper. Furthermore, we have set up a wiki (http://hacking-printers.net/) to share knowledge on printer (in)security. The highlights of the entire survey will be presented by Jens Müller for the first time at RuhrSec in Bochum. There are many cool protocols and languages you can use to control your printer or your print jobs. We assume you have never heard of at least half of them. An overview is depicted in the following figure and described below. 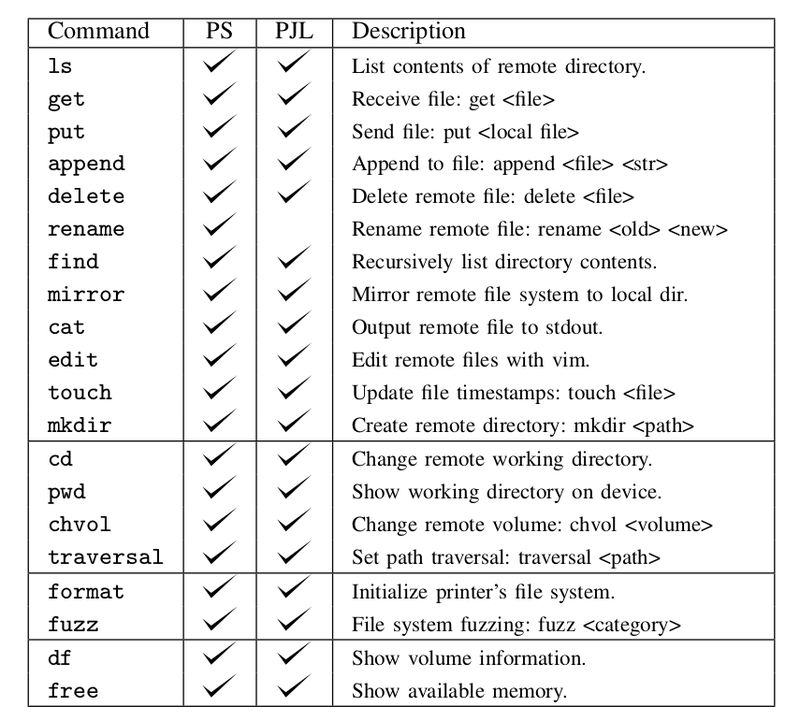 This set of languages is used to control the printer device. With a device control language it is possible to retrieve the printer name or status. One of the most common languages is the Simple Network Management Protocol (SNMP). SNMP is a UDP based protocol designed to manage various network components beyond printers as well, e.g. routers and servers. 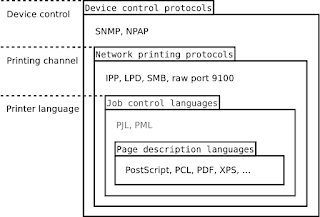 The most common network printing protocols supported by printer devices are the Internet Printing Protocol (IPP), Line Printer Daemon (LPD), Server Message Block (SMB), and raw port 9100 printing. Each protocol has specific features like print job queue management or accounting. In our work, we used these protocols to transport malicious documents to the printers. This is where it gets very interesting (for our attacks). A job control language manages printer settings like output trays or paper size. A de-facto standard for print job control is PJL. From a security perspective it is very useful that PJL is not limited to the current print job as some settings can be made permanent. It can further be used to change the printer’s display or read/write files on the device. A page description language specifies the appearance of the actual document. 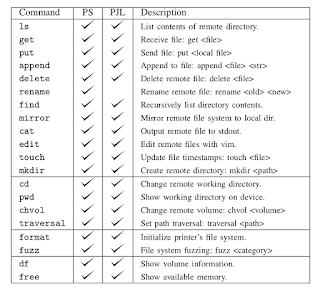 One of the most common ‘standard’ page description languages is PostScript. While PostScript has lost popularity in desktop publishing and as a document exchange format (we use PDF now), it is still the preferred page description language for laser printers. PostScript is a stack-based, Turing-complete programming language consisting of about 400 instructions/operators. As a security aware researcher you probable know that some of them could be useful. Technically spoken, access to a PostScript interpreter can already be classified as code execution. Even though printers are an important attack target, security threats and scenarios for printers are discussed in very few research papers or technical reports. Our first step was therefore to perform a comprehensive analysis of all reported and published attacks in CVEs and security blogs. 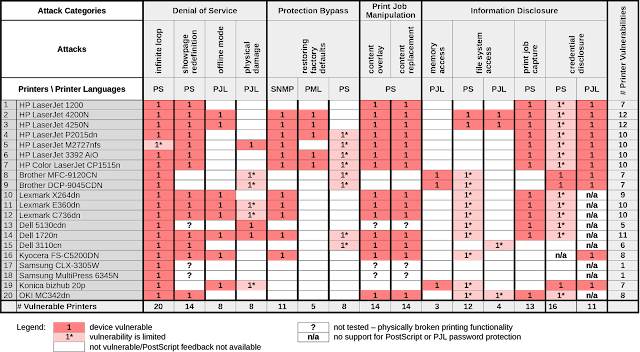 We then used this summary to systematize the known issues, to develop new attacks and to find a generic approach to apply them to different printers. 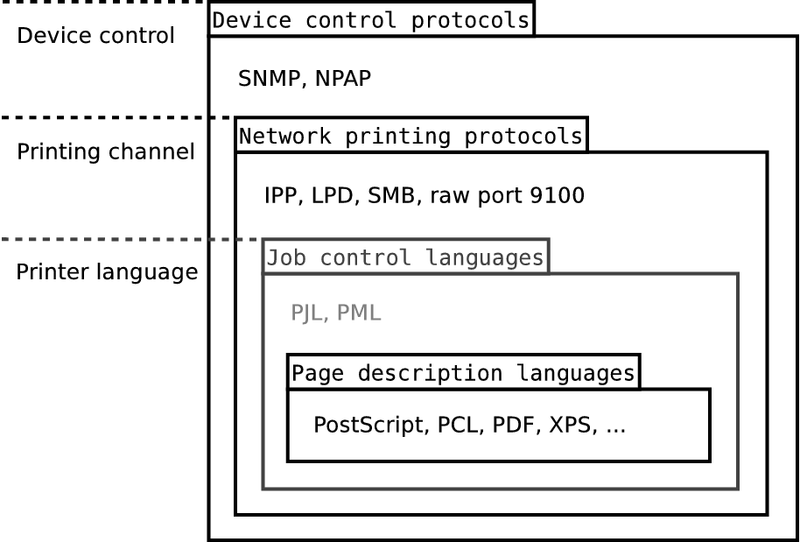 We estimated that the best targets are the PostScript and PJL interpreters processing the actual print jobs since they can be exploited by a remote attacker with only the ability to ‘print’ documents, independent of the printing channel supported by the device. We put the printer attacks into four categories. Offline mode. The PJL standard defines the OPMSG command which ‘prompts the printer to display a specified message and go offline’. Physical damage. By continuously setting the long-term values for PJL variables, it is possible to physically destroy the printer's NVRAM which only survives a limited number of write cycles. Showpage redefinition. The PostScript ‘showpage’ operator is used in every document to print the page. An attacker can simply redefine this operator to do nothing. Resetting a printer device to factory defaults is the best method to bypass protection mechanisms. This task is trivial for an attacker with local access to the printer, since all tested devices have documented procedures to perform a cold reset by pressing certain key combinations. Other languages like HP's PML, Kyocera's PRESCRIBE or even PostScript offer similar functionalities. Furthermore, our work shows techniques to bypass print job accounting on popular print servers like CUPS or LPRng. Some page description languages allow permanent modifications of themselves which leads to interesting attacks, like manipulating other users' print jobs. For example, it is possible to overlay arbitrary graphics on all further documents to be printed or even to replace text in them by redefining the ‘showpage’ and ‘show’ PostScript operators. Our prototype implementation simply increments this value to dump the whole NVRAM, which contains passwords for the printer itself but also for user-defined POP3/SMTP as well as for FTP and Active Directory profiles. This way an attacker can escalate her way into a network, using the printer device as a starting point. File system access. Both, the standards for PostScript and PJL specify functionality to access the printers file system. As it seems, some manufacturers have not limited this feature to a certain directory, which leads to the disclosure of sensitive information like passwords. Print job capture. If PostScript is used as a printer driver, printed documents can be captured. This is made possible by two interesting features of the PostScript language: First, permanently redefining operators allows an attacker to ‘hook’ into other users' print jobs and secondly, PostScript's capability to read its own code as data allows to easily store documents instead of executing them. Credential disclosure. PJL passwords, if set, can easily retrieved through brute-force attacks due to their limited key space (1..65535). PostScript passwords, on the other hand, can be cracked extremely fast (up to 100,000 password verifications per second) thanks to the performant PostScript interpreters. It then collects the printer output and translates it to a user friendly output. 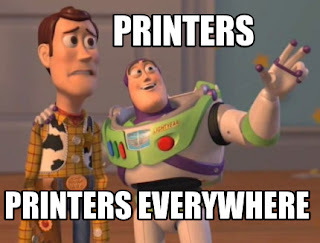 As a highly motivated security researcher with a deep understanding of systematic analysis, you would probably obtain a list of about 20 - 30 well-used printers from the most important manufacturers, and perform an extensive security analysis using these printers. The assembled devices were not brand-new anymore and some of them were not even completely functional. 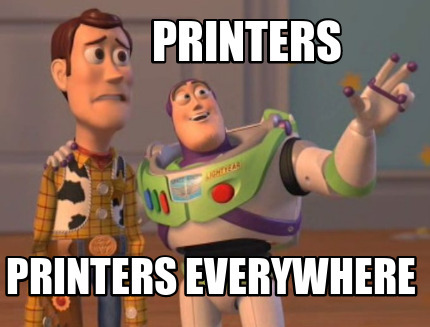 Three printers had physically broken printing functionality so it was not possible to evaluate all the presented attacks. Nevertheless, these devices represent a good mix of printers used in a typical university or office environment. Before performing the attacks, we of course installed the newest firmware on each of the devices. 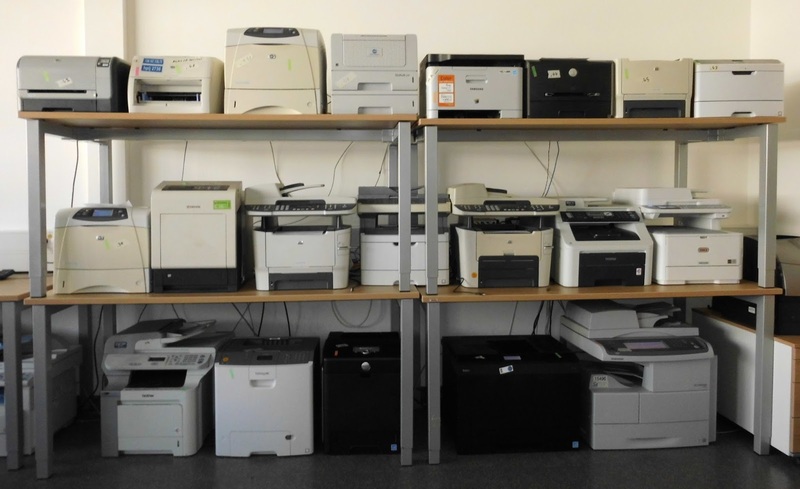 The results of our evaluation show that we could find multiple attacks against each printer. For example, simple DoS attacks with malicious PostScript files containing infinite loops are applicable to each printer. Only the HP LaserJet M2727nf had a watchdog mechanism and restarted itself after about ten minutes. Physical damage could be caused to about half of the tested device within 24 hours of NVRAM stressing. For a majority of devices, print jobs could be manipulated or captured. PostScript, PJL and PML based attacks can even be exploited by a web attacker using advanced cross-site printing techniques. In the scope of our research, we discovered a novel approach – ‘CORS spoofing’ – to leak information like captured print jobs from a printer device given only a victim's browser as carrier. A proof-of-concept implementation demonstrating that advanced cross-site printing attacks are practical and a real-world threat to companies and institutions is available at http://hacking-printers.net/xsp/. Our next post will be on adapting PostScript based attacks to websites.